Changes are on the horizon for the 2015 Stanley Cup Champion Chicago Blackhawks. After capturing the franchise’s third title in six seasons the Hawks may be bound to make some moves in the next week that fans may not like, but all teams in the NHL, even burgeoning dynasties, must adhere to the league’s salary cap. Following the 2010 title, eleven players were moved via trade or free agency thanks in part to ex-general manager Dale Tallon, who highly overpaid for free agents in order to kick-start the revitalization of the Hawks. After 2013, players like Dave Bolland and Michael Frolik were moved to address important needs. The 2015 re-structuring saw its first step taken Saturday with a trade of now-third string goaltender Antti Raanta to the Rangers. In return the Hawks received young forward Ryan Haggerty — that part of the move can be read as a preemptive move to cover the team’s depth in that position, at forward is where Chicago may see the most change by the end of this latest Stanley Cup Summer tour. As the Cup makes its go-round, current general manager Stan Bowman is in the midst of a period he may have dreaded but he’d at least was able to prepare for. Trading away first-round picks at the last trade deadline to bring in veterans like Antoine Vermette and Kimmo Timonen not only helped the Hawks in the short term but it also helped create room for their future prospects. When the 2010 team was dismantled, the Hawks had no ready-made draft picks to bring up and contribute right away, that was a contributing factor which led the Hawks to struggle just to get into the playoffs in 2011 before losing in the opening round. In this offseason, the franchise is better prepared in moving the success train with new names. Among those we can anticipate becoming more of a presence in the Hawks locker room: Teuvo Teravainen, Vitkor Svedberg, Mark McNeill, Ryan Hartman and Phillip Danault — all should receive a good look at training camp and good opportunities in making the team. 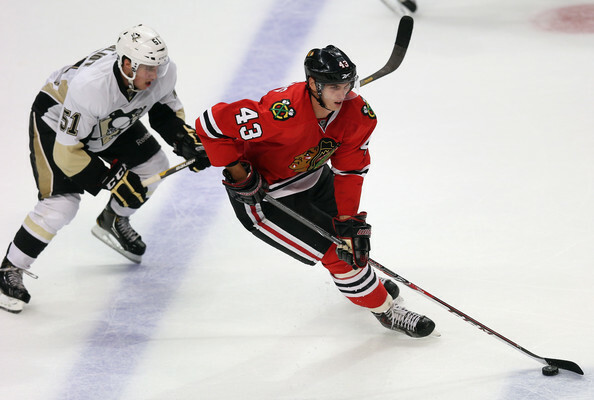 Viktor Svedberg (#43) in action during a 2013 exhibition game. It can be said that the Hawks’ template for success models that of the Detroit Red Wings of the late 1990’s/early 2000’s, it is a good format in regards of maintaining success long term but under the restrictions of a salary cap made to keep teams from making and sustaining dynasties. The Hawks’ top priorities in order to sustain success are to resign their top restricted free agents in Brandon Saad and Marcus Kruger, both of whom made major contributions to the title. Saad is looked at as another Patrick Kane because of his youth and offensive skill while Kruger is clearly the leader of the fourth line and the penalty kill unit. Among the other free agents, I expect free agents Daniel Carcillo, Johnny Oduya and Michal Rozsival to head out the door and it may not be such a bad thing to say goodbye to any of that trio mostly because of each player’s age. Other free agents in Vermette, Andrew Desjardins and Brad Richards could be brought back at the right price but other dominoes would have to fall in order for that to happen. The main question heading into this weekend’s NHL Draft in was who going to be moved first and how soon into the weekend would they be mofed? All signs pointed to Patrick Sharp filling that role, he’s in his early 30’s now and like most players who age into their early 30’s, they start to lose a step and in the past two postseasons (and pretty much this entire past regular season) its been clearly evident for Sharp that he’s struggling to generate any scoring consistency. Bickell could be in play due to the fact he makes $4 million dollars a season and he didn’t provide enough scoring in the last postseason (unlike in the previous two seasons where he was impactful), making it all the more likely that Bryan’s days as a Hawk is over. With the Hawks payroll currently at $75 million and the current salary cap set last wek at $71.4 million, Chicago may need to be even more crafty with the roster due to the potential big paydays of Saad and Kruger and let’s not forget down the line the extentions of Jonathan Toews and Kane kick in starting next season with both making $13.8M a piece. Corey Crawford — $6M (after wining his second title this season, I clearly don’t expect him to be moved; listed more as a surprise wildcard move for now). Fans may not like some of their favorite players being moved, but professional sports is a business at the end of the day and things like this happens all the time. With an aging team, players’ skills crumble and your franchise is set back for years to come, but that’s something the Hawks have given themselves a chance to avoid. A new youth movement is expected for next season, lets embrace the Hawks to come and give some of these young guys a chance. This team will still make the playoffs barring any major injuries and are still one of the top teams in the crowded Western Conference. The youth resurgence will be what the Hawks franchise need in the long run, but it will take some time. How long? Nobody has the answer. We just have to wait and see what transpires on the ice come next fall. Made Saturday as part of the second round of the NHL’s entry draft, which took place this weekend in Sunrise, Fla.